I went in early again yesterday, after waking up thinking I didn't want to go in at all. I got everything done that I needed to get done. I spent lot of time on getting all the tutoring hours together and submitting them into "the system". I asked the woman who I took this over from what happens if I made a mistake in calculating the hours. She said "no one looks at them anyway" . Ok then. I did some more work on the calendar for the summer session and started putting stuff in the course site. I don't have to have it all in by the time the course starts--just the first month or so. I can fill the rest in when I get back from Thailand. I'll probably go in again on Friday and work on it some more, but Monday is a holiday, and I will observe that. I received an email from our person who does all the hours calculations for our pay when we do things out of the ordinary. It seems complex, and she is the only one who really understands it. The part I did understand was that because we are also paying an extra person to teach over the summer, I won't be able to be paid for the stuff I am doing until the fall. I don't really understand why, but I'm ok with that. I wrote her back and asked if, when she had the time, she would be willing to teach me how this stuff works. I was going to buy another camera body before we went to Thailand with that money, and I still will, but will pay for it some other way for now, and pay that other way back later. I've been saving up the extra pay I have been getting for teaching a handful of extra classes every semester, and really only need about $400 more. Once I have that extra body, I won't have to change lenses all the time. I can keep the short lens on one body and the long lens on the other. One of my Facebook friends posted one of those things where you put up 7 books you like, and the book he posted was one I liked too, and mentioned it, so he tagged me to do the 7 day thing. Surprising, because we never interact other than to say "hi" when we see each other on campus. Anyway, I love books, and liked the idea of sharing some of my favorites. This was one of my grandfather's favorite books, and he gave it to me to read when I was a teenager. It became one of my favorites as well. 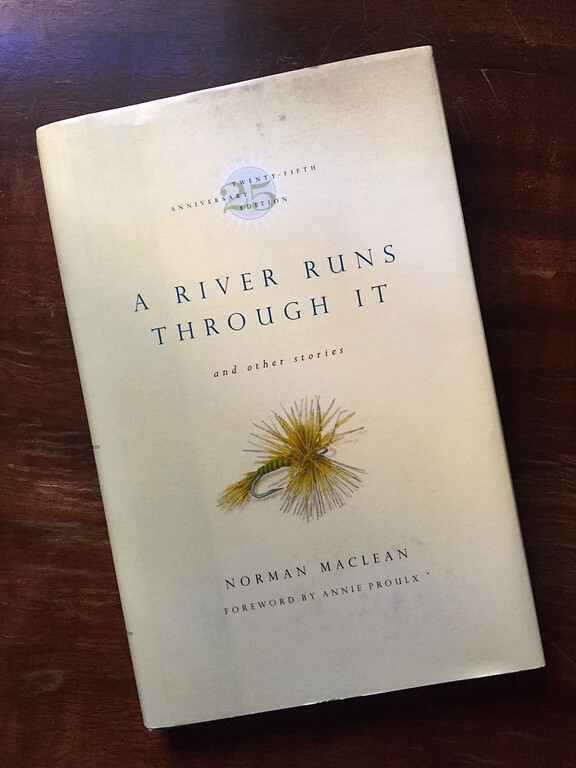 My grandfather particularly liked the idea that the author, Norman Maclean, was in his 70s when it was published. He always kept a copy of this, and a big pile of other favorite books, on his bedside stand. I took this picture of the book sitting on that same stand, which now lives in our guest room. A river runs through it.